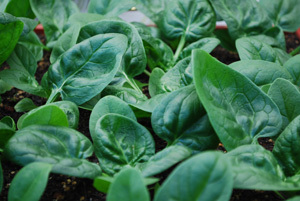 Spinach varieties come in Savoy, Semi-savoy, and Flat-leafed types, with many cultivars of each. 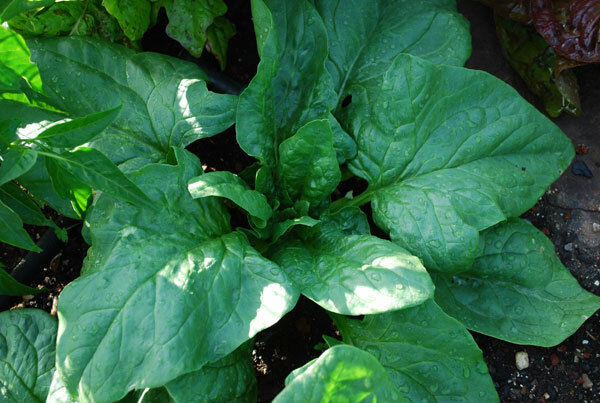 True spinach (Spinacea oleracia) grows best in the cooler temperatures of spring and fall, although early and late varieties can extend the season into summer and winter. 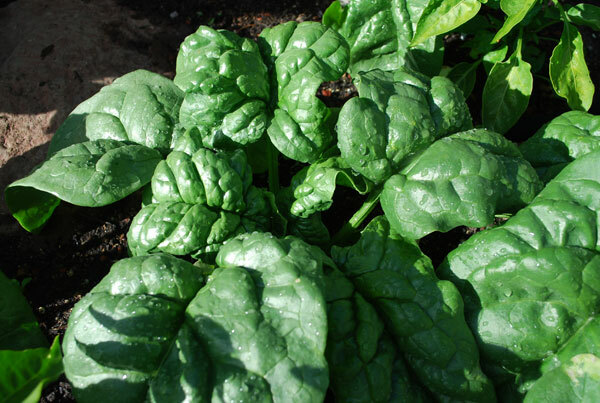 See Growing Spinach for information on how to grow spinach. Savoy Spinach is very productive and handles cold better than most types of spinach. 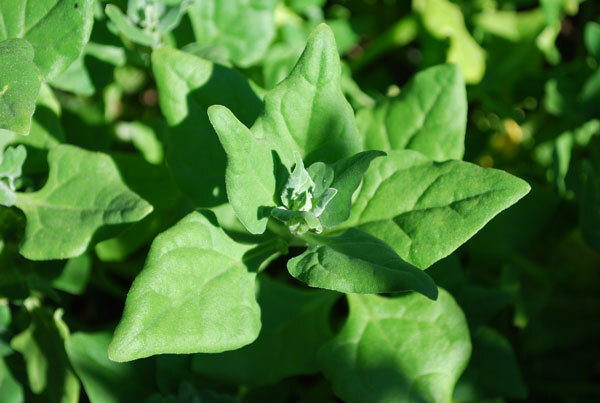 It has deeply crinkled leaves and a low growth habit that makes cleaning leaves a chore, especially in silty soils where grit splashes onto the leaves. ‘Regiment’ (F1 Hybrid, 37 days, resists mildews) produces high yields of deep green leaves that stay tender even when large. 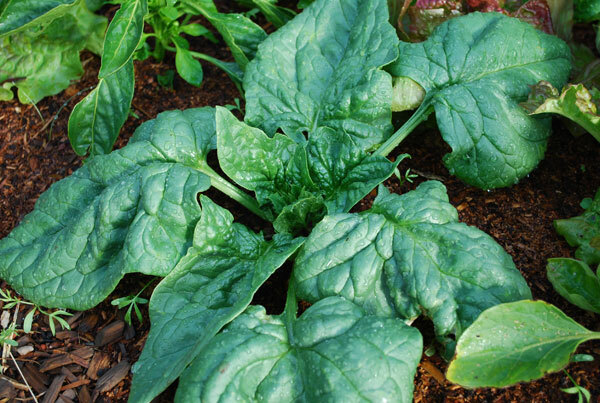 ‘Bloomsdale’ is a classic, thick-leafed, succulent savoy spinach that handles cold better than most varieties. It produces large yields in early summer, but has limited bolt resistance. Semi-Savoy Spinach varieties have a more upright habit that makes mud splash less likely, and the leaves aren’t as crinkly, so they’re easier to wash. They also tend to have better disease- and- bolt-resistance, so they’re usually the best choice when growing spinach at home. ‘Tyee’ (F1 Hybrid, 45 days, resistant to Downey Mildew races 1 and 3) is a semi-savoy variety with vigorous, upright growth, dark green leaves, and great bolt-resistance. Can be grown all year in mild-winter areas. ‘Catalina’ (F1 Hybrid 48 days) has thick, succulent, spear-shaped leaves and moderate bolt resistance. 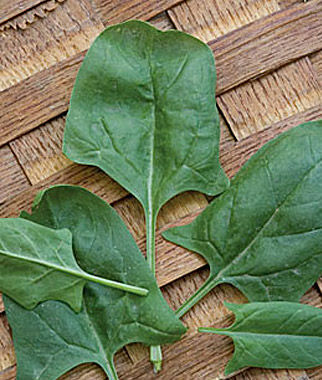 ‘Teton’ (F1 Hybrid, 40-45 days, resistant to races 1-4 of Downey Mildew) is a 3-season semi-savoy spinach with deep green oval leaves on upright plants. Very slow to bolt. 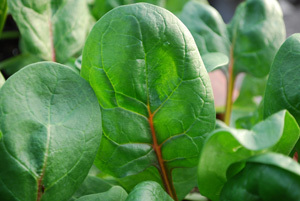 ‘Indian Summer’ (F1 Hybrid, 40-45 days, is a fine, productive, 3-season spinach for spring, summer, and fall production. Flattened, semi-savoy leaves are almost like smoothleaf spinach. Very slow to bolt. Smooth-Leafed Spinach has smooth, flat leaves that are easier to clean, which makes it the primary choice for processed spinach. ‘Space’ (F1 Hybrid, 45 days, resistant to races 1-3 of Downey Mildew) is slower to bolt than most smooth-leafed varieties. ‘Red Cardinal’ (25-30 days) has red veins in the leaves and deep red stems (like beet leaves). Harvested as baby greens, they make a beautiful addition to a salad, but they bolt faster than any green-leafed spinach and must be harvested young. New Zealand Spinach (Tetragonia tetragonioides) and Malabar Spinach (Basella alba) are botanically unrelated to true spinach, but good substitutes where summer heat limits the growth of true spinach. 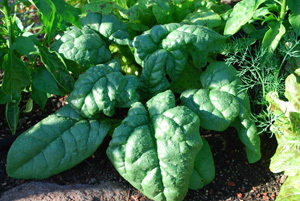 New Zealand Spinach has crisp, succulent leaves that melt in your mouth as you bite down on them. It’s good raw, but dissolves into mush when cooked. Malabar Spinach needs a lot of summer heat and a trellis to climb on to reach its true potential—a 10’ (3 m) vine! 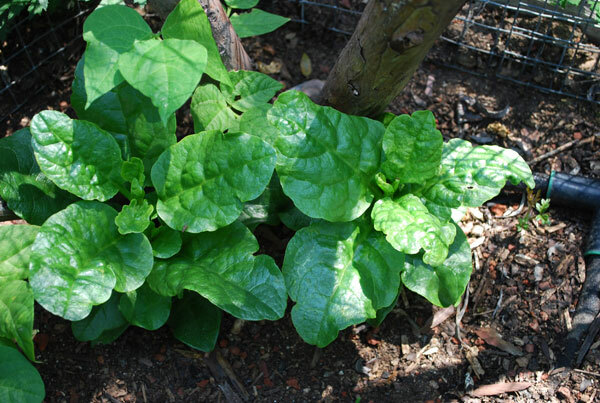 If your summers are hot enough to grow yard-long beans, Malabar Spinach is a good companion plant. Harvest side-shoots and stir-fry whole shoots and leaves.